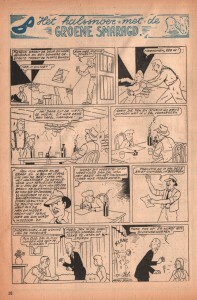 By the end of July 1949 Bob De Moor agreed to start working for the Tintin weekly, first as a layout assistant to Evany aka Eugène Van Nyverseel, and this 2 days per week. More than 3 days would be overkill as Bob De Moor knew, because he was around that time busy with – take a seat – 12 (!!) series simultaneously. Nevertheless, even those 2-days would increase the pressure, not in the least by the trips back and forth to Brussels from Antwerp. The scans shown below (just click the images to see the full sized ones) were taken from material found in the archives of the family De Moor. Page 30 of “De Koene Edelman – Het Heilige Leven Van Johannes Baptista De La Salle”. To give you an idea of the workload De Moor was confronted with, we’ll show you what he had to deliver in November 1949 for the Flemish weekly youth magazine ‘t Kapoentje (a youth extra of the newspaper De Nieuwe Gids). In the issue of November 24 you find 4 stories which De Moor worked on, all signed as ‘Bob – Artec-Studio’s‘. The first is “De Koene Edelman – Het Heilige Leven Van Johannes Baptista De La Salle” on a scenario written by Gaston Durnez which you find on page 2. 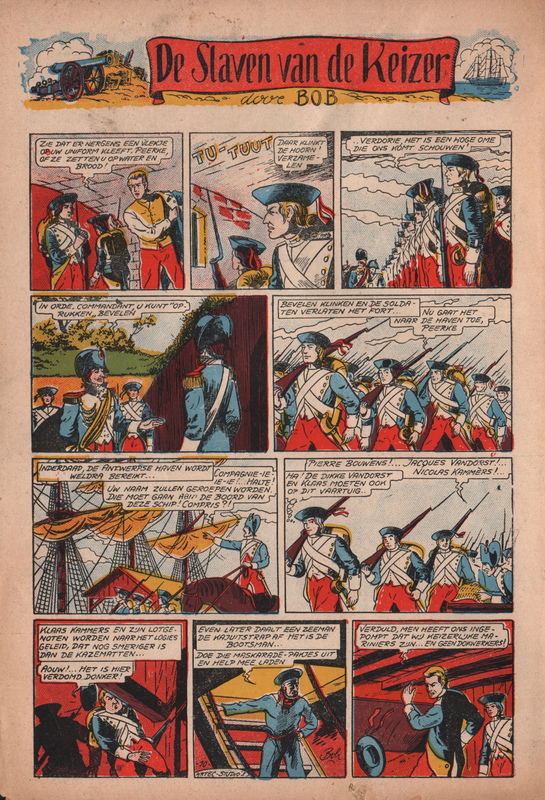 The clear drawing style was similar to the one used by Jef Nys, Jijé and Sirius for their comic adaptations of all kinds of biographies, Jijé’s “Don Bosco” probably being the best known one. The print in this issue is black on white with red as a supporting – non-dotted – colour. Gag 107 of “De Lustige Kapoentjes”. 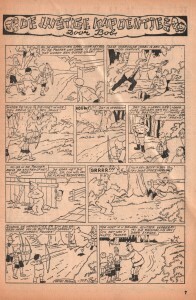 On page 7 you see “De Lustige Kapoentjes”, Bob De Moor‘s adaptation of Willy Vandersteen‘s “De Vrolijke Bengels”. The story behind this switch is a complicated one. Vandersteen had left De Nieuwe Gids to start work for De Standaard where he continued the series “De Vrolijke Bengels” in the youth weekly Ons Volkske. With Vandersteen gone, Marc Sleen – who was the chief editor of ‘t Kapoentje – decided to start a new series very similar to the popular “De Vrolijke Bengels”: “De Lustige Kapoentjes”. But instead of drawing it himself, he asked Bob De Moor to work on it. De Moor would work on the series until he joined the Studio Hergé in late 1949. After that Marc Sleen would continue the series. It wouldn’t be the only Vandersteen story De Moor would re-create (see this article on “Babbel & Co”). Page 15 of “Het Halsnoer met de Groene Smaragd”. 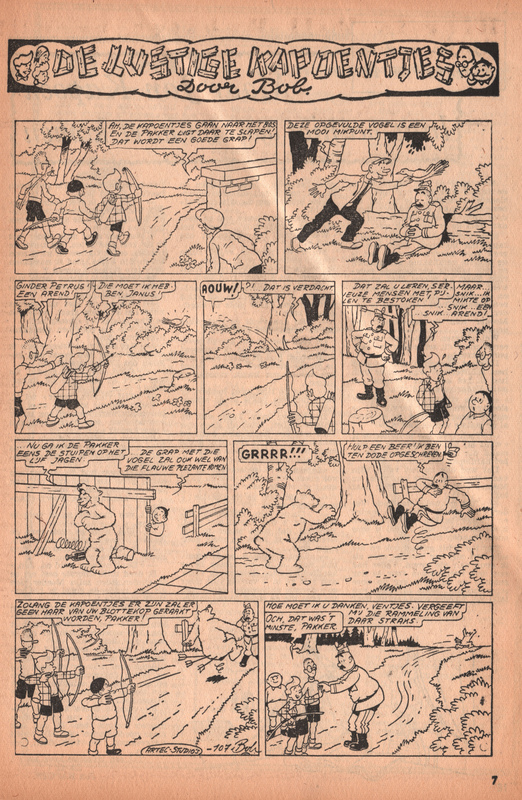 You’ll see that the style used in this page of “De Lustige Kapoentjes” is very similar to the clear line used in De Moor’s later work for the Tintin weekly. The clear line was already very much present there. On page 10 you find the story “Het Halsnoer met de Groene Smaragd”. The crime story itself would be published in 1988 by De Dageraad in a split album which also holds “De Slaven van de Keizer”. That’s 39 years after first being published in ‘t Kapoentje. The style of this story is a little bit less developed than “De Lustige Kapoentjes” and looks more hasty. At the same time it also includes a more realistic style used for one of the villains (frame 5), but most of the characters in this story are not really developed graphically. The story would also remain a one-off project and never be turned into a series. 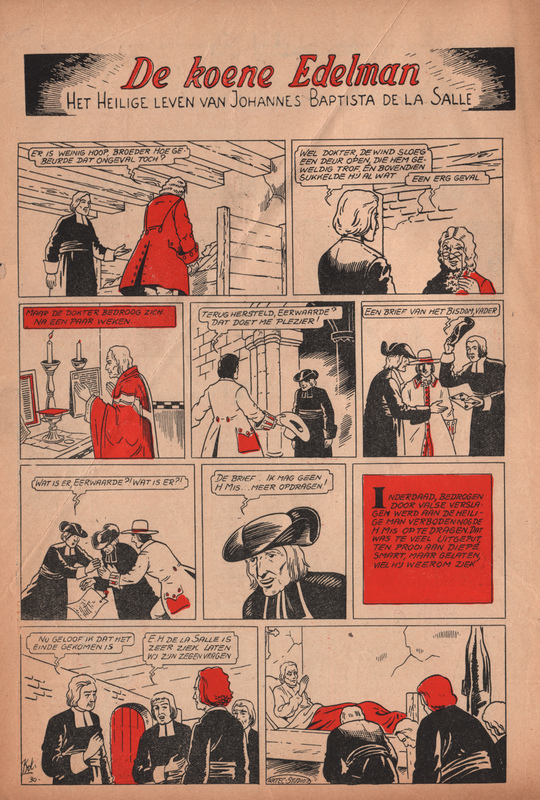 Page 10 of “De Slaven van de Keizer”. The back of the magazine, page 20, features the 4th story of Bob De Moor: “De Slaven van de Keizer”. And this one is in full – partially dotted – colour as you can see. As written above this story would be published together with “Het Halsnoer met de Groene Smaragd” in one single album in 1988 by De Dageraad. Alas, not in colour but in black and white which kinda damaged the overall quality of the series. However, if you want to get hold of this story, you either will have to buy all issues of ‘t Kapoentje featuring this story (expect to pay a lot) or get hold of the album issued by De Dageraad, which, let’s be honest, should be in your collection to start with :). Graphically De Moor is in his element, after all the story is taking him to the sea. The realistic style applied here by De Moor is topnotch and even reminds of Hec Leeman‘s excellent Bakelandt series. Expect some more of this pearls in the future! 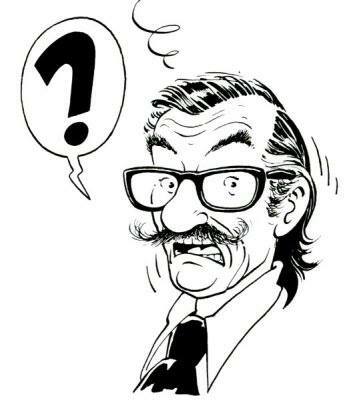 Did you know that besides Bob De Moor another young Flemish cartoonist started working at the cartoon filmstudio AFIM? His name: Jef Nys ( Jommeke, De Kapoentjes, Langteen & Schommelbuik). He collaborated on the 12’25 cartoon “Smidje Smee” (animation about the legend of a blacksmith who sells his soul to the devil – see the image below), together with Bob De Moor in 1942, although Nys is not always credited in the info available on this short animation film. Nys only stayed for a very short time at the AFIM studios: after 4 days the principal of the academy warned him he would be expelled if he didn’t return right away to the academy instead of wasting his time at the AFIM studios like that other bohemian De Moor… Nys left while De Moor stayed but after a V-bomb destroyed the academy’s garden the institution got closed and Nys started working for the Antwerp based architect Maurits De Vocht. The rest is history! The short film is still being shown here and there at festivals. We haven’t been able finding a copy yet. The animation studio AFIM was founded in Antwerp in 1940, by Ray Goossens together with Jules Luyckx and Henri Winkeler. 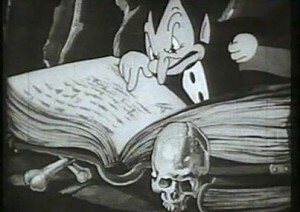 They created a number of short animated movies, of which “Smidje Smee” (1942) was the most successful. 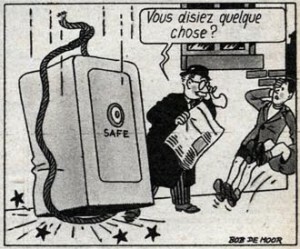 3 other cartoons included “Rapi Roum and Metamorfose” (1940), “Hoe primmeke ter wereld kwam” (1941) and “De lamme maakt een ritje” (1947).